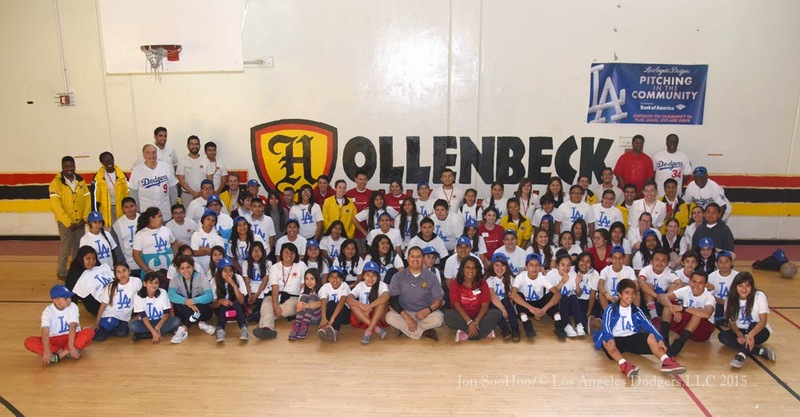 The Dodgers continued their community caravan yesterday afternoon at Hollenbeck Middle School in Los Angeles. Former Dodgers' Al Downing, Lee Lacy, Tim Leary and Dennis Powell visited with 100 students. The photo above of the entire group is from Jon SooHoo/LA Dodgers 2015. Go here to check out more photos from him of the event. Jon Weisman at Dodger Insider tells us the "New uniform numbers for the 40-man roster." Joc Pederson will wear a new number; #31. Via Eric Stephen at True Blue LA, "Robert Carson, Theo Alexander suspended 50 games for positive drug test." ICYMI: Here's a great story by Jorge Arangure Jr. at Vice Sports about Yoan Moncada and, "The Weirdest Cuban Baseball Defector Story You'll Ever Read." Hastings won't talk about what role Nicole Banks—a California based agent with previous experience representing Cubans—played in Moncada's travels. Banks is rumored to be romantically involved with Moncada and to have possibly had his child in September. In early October, a baby registry existed on the website thebump.com that listed Banks' and Moncada's names with a due date of September 2014. That registry has since been changed to show only Banks' name and a September 2015 due date. Just more Yoan Moncada news. Via Ben Badler at Baseball America, "MLB, Not OFAC, Is Why Yoan Moncada Can’t Sign." The holdup is that MLB won’t let Moncada—or any Cuban player, for that matter—use the general license any more. That wasn’t always the case. Yasiel Puig, for example, signed using the general license. It’s not clear what exactly changed, but at some point in 2012 after Puig signed in June that year, MLB no longer allowed Cuban players to sign using the general license and instead required them to apply for the specific license, which is a written document from OFAC. That goes beyond what the government requires from Cuban players to be able to begin their careers, and with some players waiting six months to receive their licenses, MLB’s policy has added a significant bottleneck for those players. On the other hand, Jeff Passan at Yahoo writes that the Treasury Department has just announced they will no longer be issuing specific licenses referenced above, so Moncada may be able to sign a contract sooner rather than later. MLB was drafting a letter to OFAC on Tuesday asking for a meeting in the near future to clarify the new regulations and potentially change league policy, which requires a specific unblocking license. Should a meeting take place soon, one league official estimated Moncada could be free to negotiate with teams within two weeks. Topps is selling exclusively through their website a Sy Berger 1951 Tribute Collection of cards featuring the 1951 Red/Blue Back set design, and several Dodgers are included. See them above. Available are 10" X 14" sized prints of Kershaw, Puig and Jackie Robinson, as well as, postcard-sized cards sold in complete set form. Go here to check them out at Topps.